Jill McLennan watches Jingletown, her neighborhood of 14 years, transform into a community of development. McLennan completed her first public art project with Madison Park Development Corp. She designed 10 panels of birds flying over the Oakland and Jingletown skyline, framing the entryway with a 40’ visual screening above. She worked with Claire Han of Madison Park, and the architect, Toby Levy, with fabrication by DEKA Fabrications and GK Welding. McLennan’s concept for this piece is to emphasize the mixed use history of Jingletown and to celebrate the balance that exists between residents, businesses and the natural environment. The industrial nature of the material, steel, reflects the steel industry that once dominated this area. 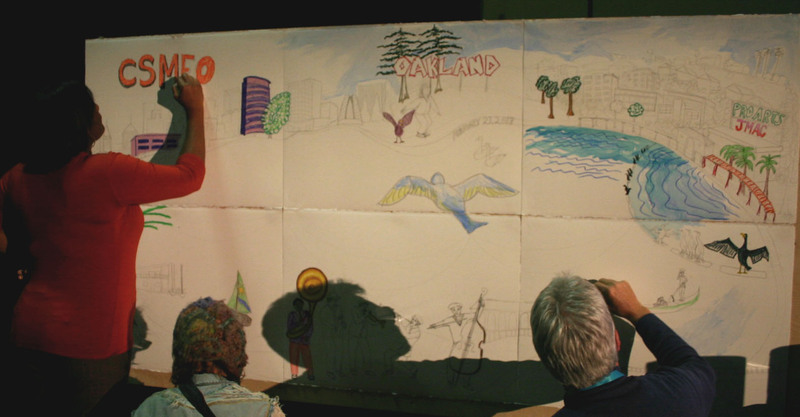 The skyline depicts vantage points throughout the neighborhood, both local and historical details and familiar views of Oakland and Mt.Tam. The birds in flight and on wires are based on direct observation of the activities of birds living here, migrating through and filling our neighborhood with activity and song. The birds are also a metaphor for the people, coming and going, roosting and nesting, working independently and as a community to create a place to call home. The front doors depict the wetlands that once stood where Jingletown is now. They celebrate the wildlife that continues to thrive in the natural estuary of the bay that borders our unique chosen home. I have taken lots of workshops and am myself an art teacher and artist. Jill lead the workshop with a perfect balance of structure and flow. The atmosphere was very relaxed and comfortable and at the same time Jill’s demonstrations and information were clear and easy to follow. She even made us scones and coffee…what more could you ask for? I painted with pigmented wax! This is really exciting. I barely knew about encaustics before I signed up for the workshop, but knew I would love it. Combining color and texture and a bit of that waxy smell … had to be a winning mixture. I knew I would find it very enticing. I though the handout of history, materials, application and safety guidelines were very thorough and well thought out. Also as a non-artist, at no time did I feel concerned that I wouldn’t finish my piece, because I thought your basic instructions were easy to comprehend, easy to follow and they allowed me to come up with my own techniques. I had a great time and would definitely sign up for more classes with you. 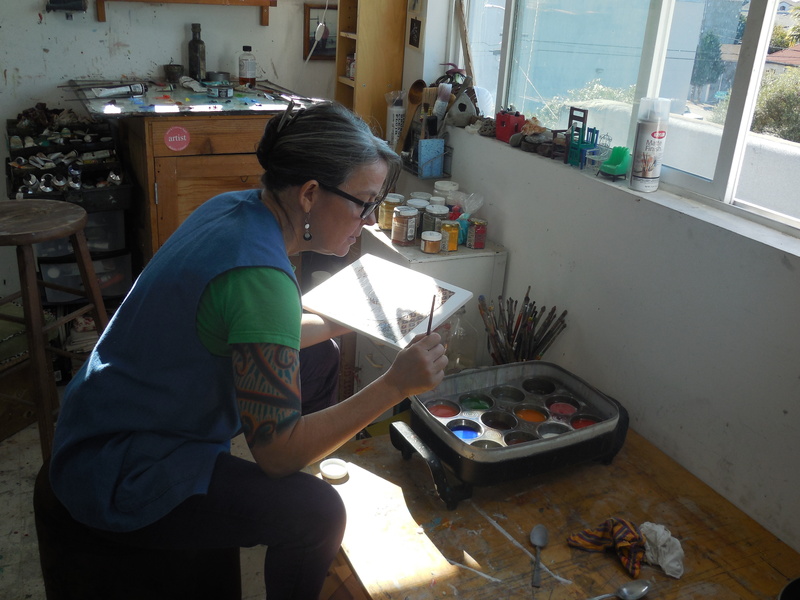 Jill is an artful facilitator and gently guided the class into productive experimentation and exploration. She gave a lot of information but did not overwhelm us, but at the moment I was ready to absorb more, she was there with new information, resources, and experiences. 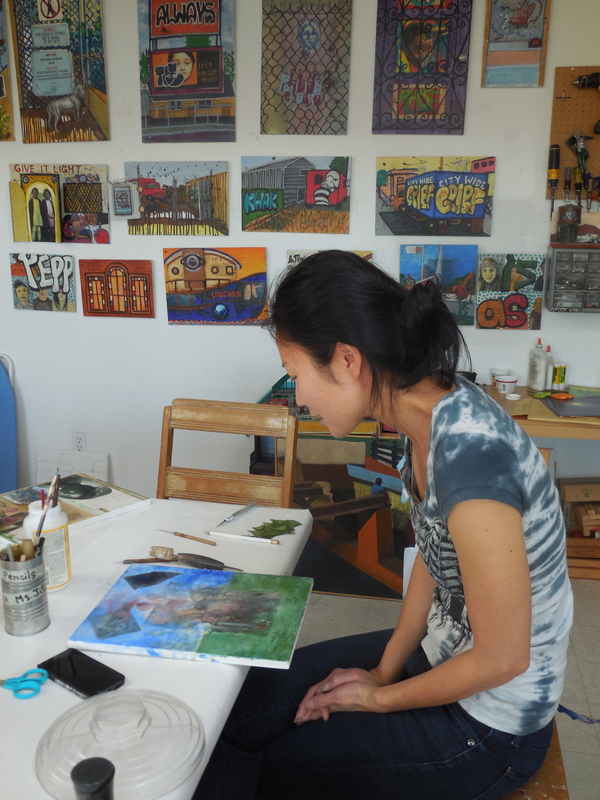 Jill is very knowledgeable about her subject, which showed in her ability to adapt and guide us in response to our learning, and like her studio space, creatively energetic and inspiring. Summer 2014: Jill McLennan teaches summer camp at the Randall Museum in San Francisco for her fifth consecutive summer. She leads students of varying ages in curriculum concerning the materials of art, the natural environment and the future of our impact on the planet. 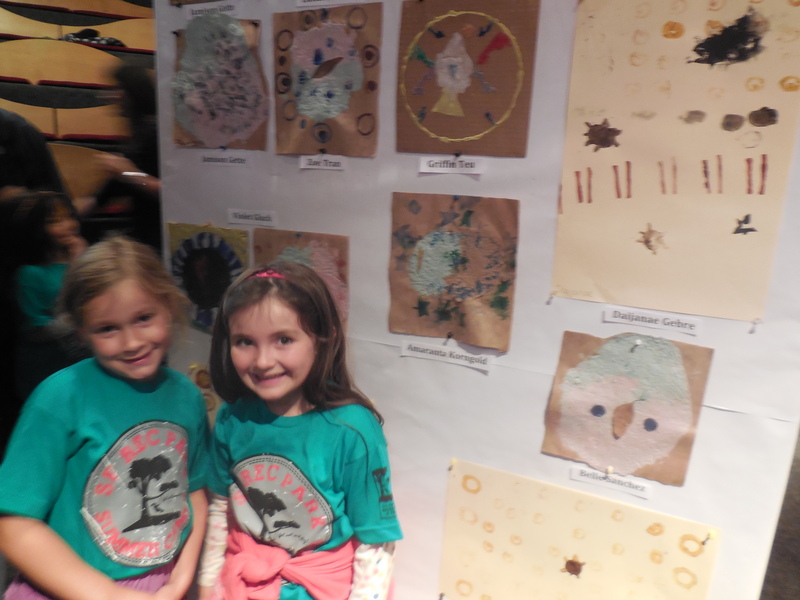 Depicted here are several lessons in the curriculum including architecture, animal habitats and earth arts including: sand painting and handmade paper. 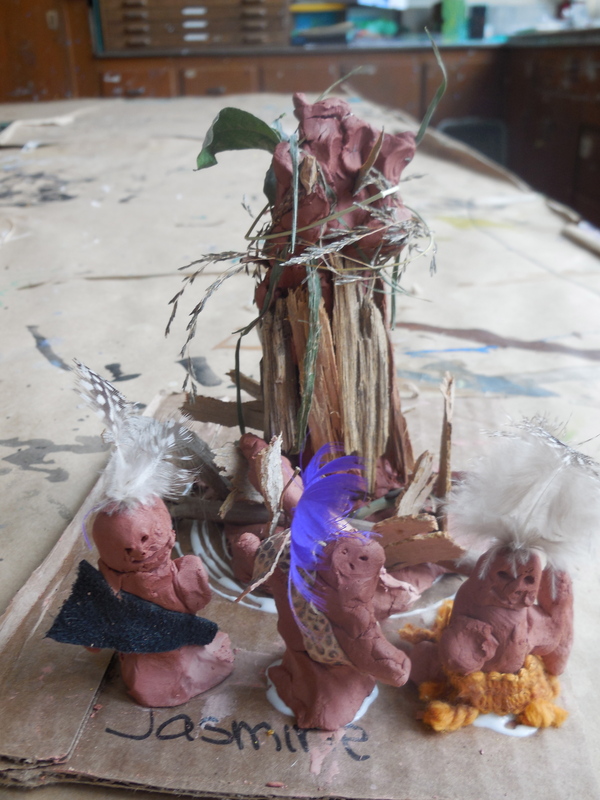 Students learned about native dwellings and created homes for humans using natural materials: clay as mud or stucco, dirt, twigs and grasses and leather. Then they used recycled materials to create homes for the future that include solutions towards living with the earth for the future. 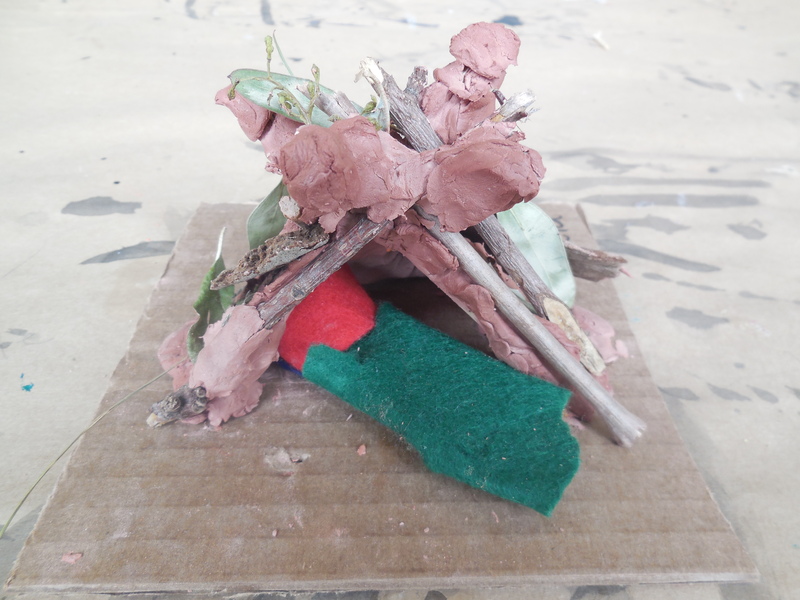 A student example of a native dwelling made using natural materials. Another Native Dwelling example, complete with the people who live there. 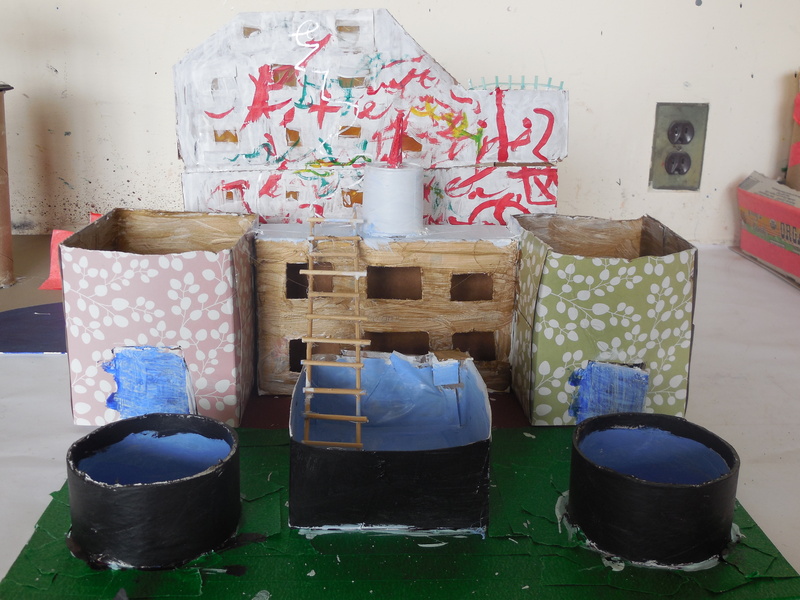 Students desugned homes using recycled materials that provide solutions to living in an environmentally friendly way. 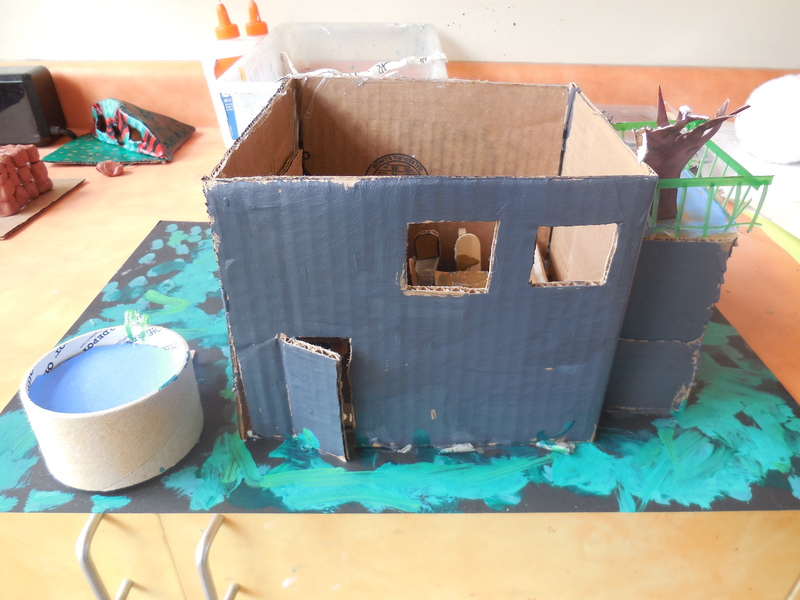 This student designed a shelter for both humans and animals to live peacefully together. 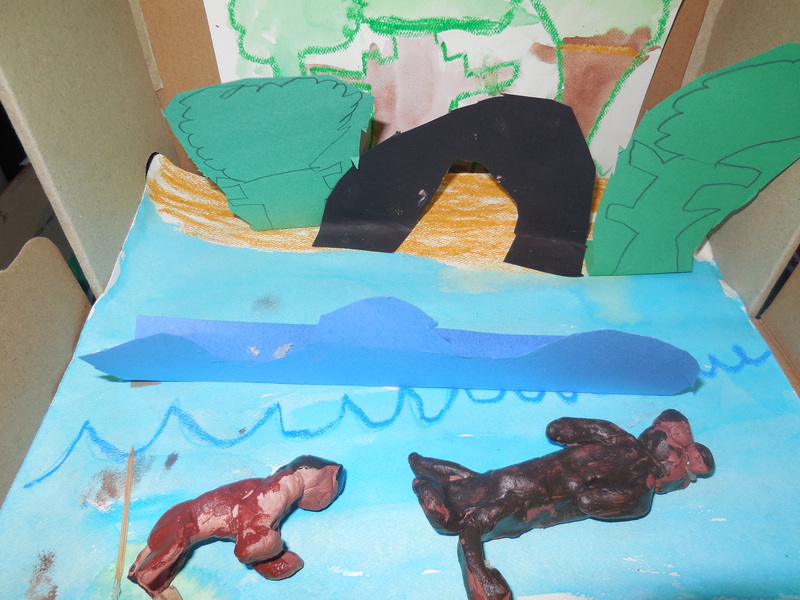 This student created a habitat from a shoe box for his mother and child otters that he made out of clay. 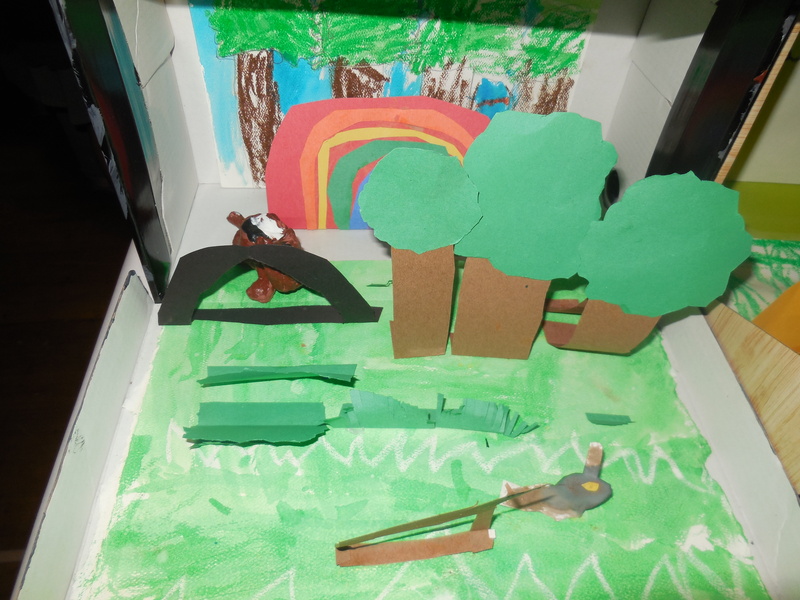 This student created a vibrant habitat for a small animal that sleeps in a cave. 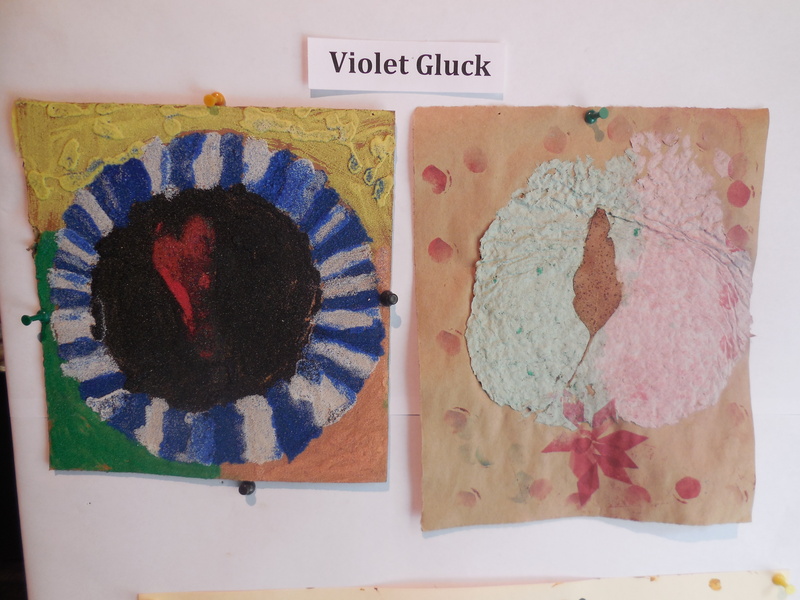 Student Examples of Native American Medicine Wheel sand painting and handmade paper using recycled and natural materials. Students with their work from art camp. 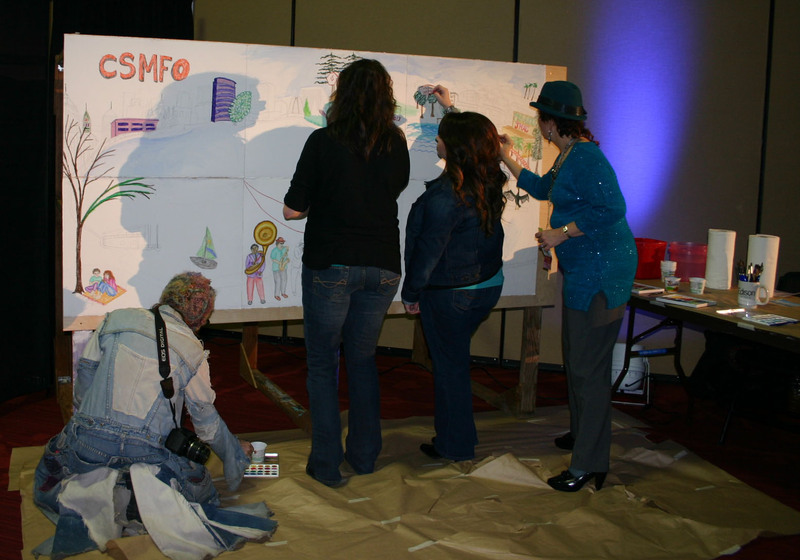 JMAC partnered with ProArts Gallery to present a community participation mural at the California Finance Convention on February 22, 2013. 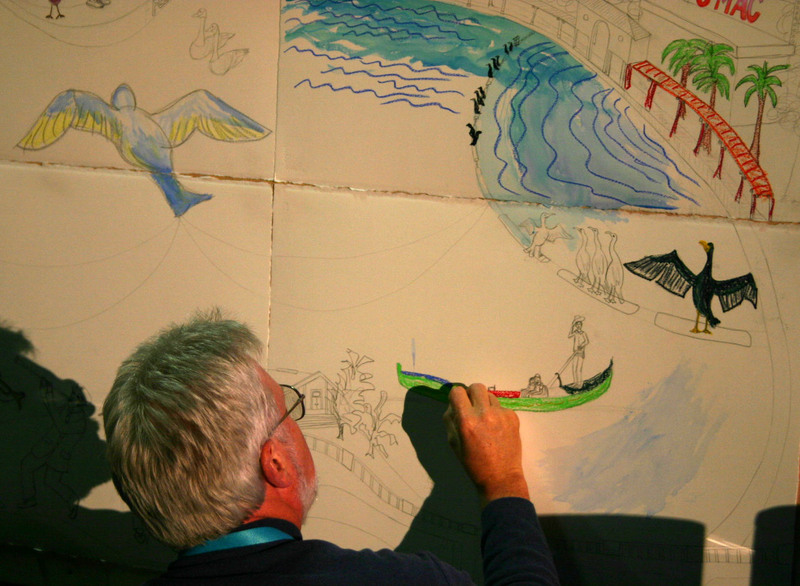 McLennan designed a mural of Lake Merritt for participants to complete. 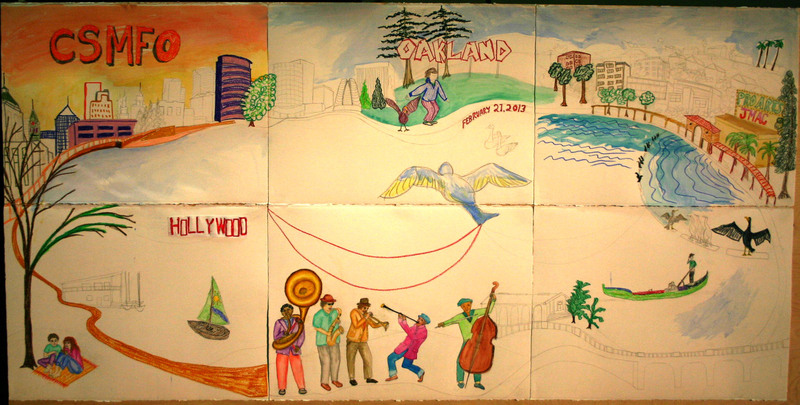 The mural includes the urban and natural center of Oakland depicting downtown businesses, residential areas, a variety of birds, and recreation activities, people, boats and a Jazz band. 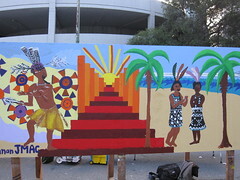 JMAC offers Event Murals for all occasions. 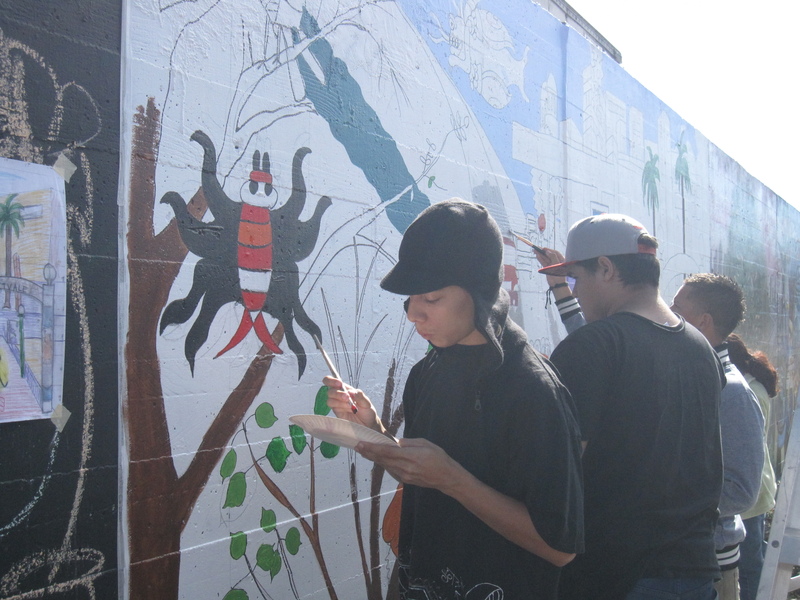 Adults, youth and families may participate in a mural at your company or private event. Murals are designed based on the desires of the hiring agency and the style of the artist Jill McLennan. Please contact JMAC for further information or to book your event mural today! 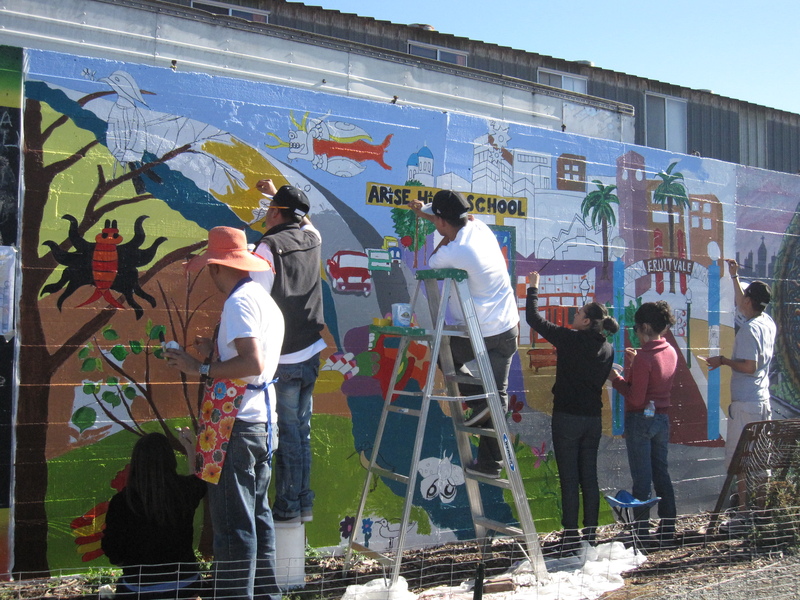 Check out local high school students from Arise High School, located at the Fruitvale Plaza, painting the mural they designed in Jingletown. 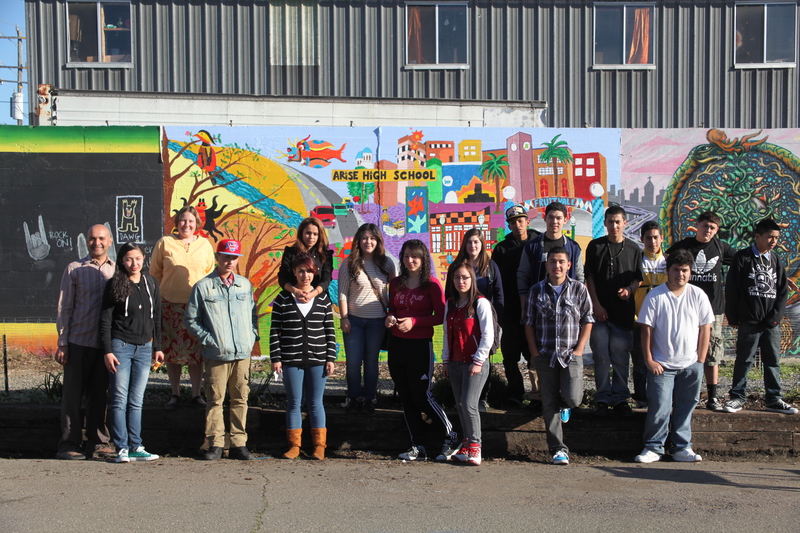 The project is organized by Jill McLennan, culminating the Peterson St. Art Wall and Garden that we began in 2009. 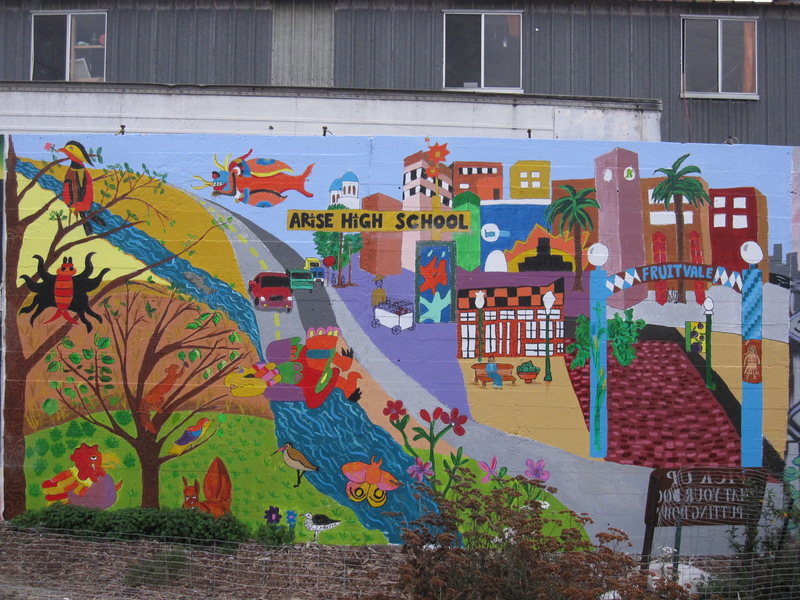 The project is made possible by a grant from the Oakland Cultural Funding Department and a partnership with Arise High School art teacher Nils Heymann and his Juniors and Seniors.